When you sign up for the Online Store, it uses your settings to automatically fill out most of your business information. Sometimes you may need to fine-tune the settings: your business might be in the United Kingdom, but you sell products mainly in the United States. Go to the Settings tab and click Business Info. Country/Region: Use the menu to choose another country. (More country choices will be added in the future.) Be aware that your choice may affect your available payment method since not every method is supported worldwide. 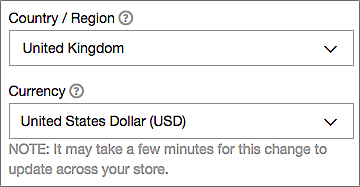 Currency: By default, the currency is paired with your Country/Region choice. If you change the currency, it may take several minutes for the change to be applied throughout your store. Note: Changing the currency after you begin selling products will reset the Dashboard's Snapshot and Weekly Breakdown sections to zero (more info). Measurement system: You can switch between US/Imperial and Metric system if needed. The unit of measurement you select will be used to determine shipping charges if you set up a weight-based shipping method. Date Format: You also can choose from three formats to match where you sell products. This date format will appear in your order confirmation emails and invoices.